Following the publication of his final fictional work, Roxana, the Fortunate Mistress, Defoe began to write and publish more explicitly religious works. 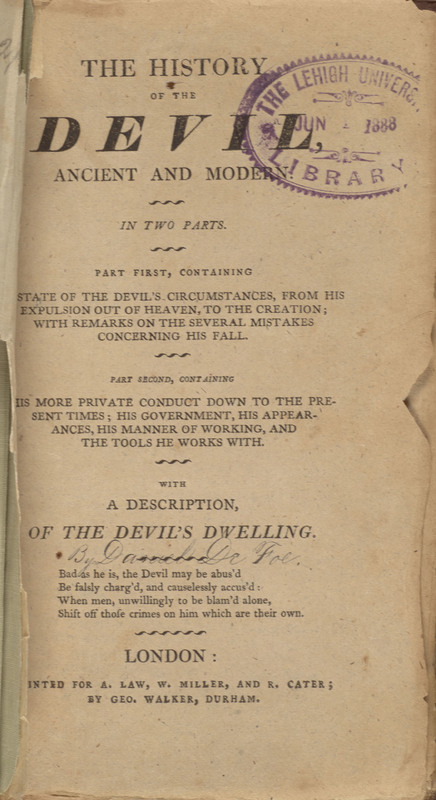 In this book, first published in 1726, Defoe develops his theological belief in the Devil as a force that acts on society and individuals to encourage harmful behavior. Defoe’s controversial Presbyterian religion likely contributed to his personal belief in a Devil who influences mankind through human agency rather than assuming a physical form. Notably, Defoe engages with Milton’s Paradise Lost, another pillar of English literature, in how this work depicts the Devil. The topic of the Devil and Defoe’s wider theological beliefs are also featured prominently in Robinson Crusoe, though that work highlights God’s beneficent providence rather than the Devil’s malignant influence. The History of the Devil, Ancient and Modern. In Two Parts ... With a Description of the Devil's Dwelling…London: A. Law, W. Millar, and R. Cater, 1793.